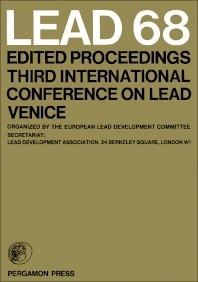 Lead 68: Edited Proceedings, Third International Conference on Lead Venice focuses on the compositions, characteristics, uses, and reactions of lead. The selection contains the proceedings of the Third International Conference on Lead held in Venice on September 17-20, 1968. The book first reviews the lead sheathed cables in France and Italy, including the utilization of lead sheathed cables in Italian telephone companies; lead sheathed power cables in France; and experience of Les Cables de Lyon on lead sheathing submarine cables. The text examines the influence of lead sheath thickness on service performance of power cables. The selection takes a look at developments in the quality control of extruded lead sheath cables. The seam-failure phenomena in cable sheaths and the techniques in testing seam strength are underscored. The text also offers information on the characteristics of lead alloys for oil-filled cable sheathing; the metallurgical investigations on a Pb-Sn-Sb alloy for cable sheathing; and studies on semi-sealed lead-acid batteries. The book also discusses the chemical and other applications of lead. Increase in resistance of lead to creep stress by reaction products formed in the melt and anodic and chemical corrosion of lead base alloys in sulfuric acid solutions are discussed. The selection is a vital source of data for readers interested in the compositions, characteristics, reactions, and uses of lead.